Found her on the 1870 Meramec, St. Louis, Missouri census (img 9) as Elizabeth Finger age 45. 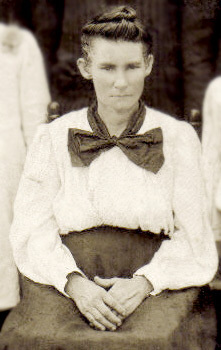 Found her on the 1920 Hillsboro, Dillon, South Carolina census (dist 29 img 21) as Maud Meekins age 22. Found her on the 1930 Marion, Marion, South Carolina census (dist 5 img 6) as Maud Meekins age 29. Found her on the 1910 East Brandywine, Chester, Pennsylvania census (dist 17 img 7) as Rebecca Nicholas. Penn Yan, May 8 - Oscar H. Ackerson, 86, Penn Yan, died at Soldiers and Sailors Memorial hospital Saturday after several months illness. Mr. Ackerson was born in Hall, May 17, 1863, a son of John and Nancy Earley Ackerson. In 1839 [sic], he married Miss Sadie Hoose at Bellona. Mrs. Ackerson died in 1931. He was well known throughout this area where for the pest years he had been a painter and paper hanger. Surviving are two daughters, Mrs. Clarke Finger, RD 3; and Mrs. Howard Monroe, Ithaca; a son, Charles, RD 5; two grandsons and one great granddaughter. Found him on the 1900 Penn Yan, Yates, New York census (dist 142 img 9) age 37, butcher. Found him on the 1940 Jerusalem, Yates, New York census (dist 62-12 img 11) as Ausker Ackerson age 76, widower, living in the household of his son Charles. Found him on the 1920 Starkey, Yates, New York census (dist 187 img 13) as Calvin J. Cummings age 7. Found him on the 1930 Torrey, Yates, New York census (dist 20 img 1) as Calvin E. Cummings age 18. Found her on the 1940 Germantown, Columbia, New York census (dist 11-17 img 18) as Mary Fingar age 8. Found him on the 1910 Salisbury, Rowan, North Carolina census (dist 110 img 32) age 5. Found him on the 1920 Salisbury, Rowan, North Carolina census (dist 129 img 89) as Alton Finger age 15. Found him on the 1930 Salisbury, Rowan, North Carolina census (dist 36 img 42) as David A. Finger age 25, single, living at home, optometrist. Found him on the 1930 Salisbury, Rowan, North Carolina census (dist 36 img 42) age 35, single, living at home, optometrist. Found him on the 1850 Blount, Tennessee census (dist 11 img 14) as Jos Finger age 12. Found him on the 1870 Meramec, St Louis, Missouri census (img 9) as Joseph Finger age 32, farmer. His wife is Darkes age 25, born Tennessee. He is living next door to his brother Jonathan. Also in his household is William Clemens age 14 and John Clemens age 21, farm laborer. Some researchers show her as Julianna Finger, some as Eulalia "Euley" Finger. Found her on the 1850 (not stated), Cherokee, North Carolina census (img 39) as Julia Pendergrass age 55. Found her on the 1860 Prairie, Washington, Arkansas census (img 36) as Julia Pantergrass age 66. Found her on the 1880 Dardanelle, Yell, Arkansas census (dist 218 img 26) as J. A. Pendirgrass age 85. She is living with her daughter Harriet and her husband Robert Moore. Found her on the 1870 Newton, Catawba, North Carolina census (img 41) as Mary Finger age 9. Found her on the 1880 Ironton, Lincoln, North Carolina census (dist 101 img 12) as Mary Finger age 18. Found her on the 1900 Ironton, Lincoln, North Carolina census (dist 109 img 39) as Mary Dellinger age 37. Found her on the 1910 Dallas, Gaston, North Carolina census (dist 55 img 40) age 47. Found her on the 1930 Ironton, Lincoln, North Carolina census (dist 8 img 27) age 67. Found her on the 1920 Manhattan Assembly District 14, New York, New York census (dist 1021 img 5) as Maurie Finger age 9 years 6 months. Found her on the 1880 Pike, Clark, Ohio census (dist 41 img 13) as Florence H. Austin age 26. Found her on the 1900 Springfield Ward 5, Clark, Ohio census (dist 33 img 4) as Florens Austin age 46. Has given birth to 2 children, 2 are living. Found him on the 1900 Newton, Catawba, North Carolina census (dist 46 img 12) age 9 months. Found him on the 1920 Lincolnton, Lincoln, North Carolina census (dist 108 img 25) as Carl D. Honeycutt age 20, laborer, lumber co.
She had no children. - Husband Webster Finger's obituary. Found her on the 1870 Geddes, Onondaga, New York census (img 5) as Kitty Kinney age 18. Found her on the 1880 Syracuse, Onondaga, New York census (dist 212 img 1 above) as Kathrine Finger age 28. Address: 139 West Fayette Street. Father, mother born Ireland. Found her in the 1902 Syracuse, New York city directory as Catherine J. Finger, widow Webster, h. 504 S. Salina suite 28. Found him on the 1860 Salem, Champaign, Ohio census (img 43) as Frederick Landis age 61, farmer. He and his family are living next to his son's family James and Phebe Landis. Burial place from personal observation of the footstone. Found him on the 1910 Westmoreland, Oneida, New York census (dist 176 img 19) as William O. Law age 7. Found him on the 1940 Westmoreland, Oneida, New York census (dist 33-102B img 5) as Oscar Law age 37, farmer. Found him on the 1870 Saugerties, Ulster, New York census (img 95) as William Lent age 7. Found him on the 1880 Glasco, Ulster, New York census (dist 155 img 7) as Wm L. Lent age 17. Found him on the 1900 Fishkill, Dutchess, New York census (dist 9 img 54) as William Lent age 36. He and his family are living next to his brother Davis Lent. Found her on the 1920 Jerusalem, Yates, New York census (dist 177 img 17) as Iva M. Blakesley age 24. Found her on the 1930 Fayette, Seneca, New York census (dist 8 img 19) as Iva M. Lerkius age 33, wife of Ernest Lerkius, a second marriage. Found her on the 1930 Town Creek, Brunswick, North Carolina census (dist 11 img 11) as Stella Klutz age 22. Found her on the 1930 Benton, Yates, New York census (dist 6 img 18) as Mildred Newby age 8. Found her on the 1880 Russia, Herkimer, New York census (dist 36 img 39) as Eva C. Pullman age 9. Found her on the 1900 Russia, Herkimer, New York census (dist 63 img 10) as Eva C. Barney age 29. Has given birth to 4 children, 4 are living. Found him on the 1920 Ivy Hill, Haywood, North Carolina census (dist 76 img 11) as William Rich age 7. Found him on the 1930 Ivy Hill, Haywood, North Carolina (dist 14 img 21) as William Rich age 17. Found her on the 1920 Clermont, Columbia, New York census (dist 14 img 13) as Florence Moore age 26. Found her on the 1850 Lodi, Seneca, New York census (img 36) as Elmira Shannon age 9. Found her on the 1860 Lodi, Seneca, New York census (img 25) as Almira Shannon age 19. Found her on the 1850 Blount County, Tennessee census (dist 15 img 2) as Delila Finger age 45, head of household. Found him on the 1850 Division 3, Tippah, Mississippi census (div 3 img 14) as Theodore Whitlow age 4. Found him on the 1860 Southern Subdivision, Tippah, Mississippi census (img 171) as Theadore Whitlow age 15.